In helmet-speak, that's the all-too-common dogma thrown out between the Budget Camp versus the Purist Camp. Let's not kid ourselves; motorcycling is an expensive lifestyle/hobby. It isn't like, say snowboarding, where you spend the dough needed to get every gear you need – board included – then just pay for your lift tickets every season from there. Nope. 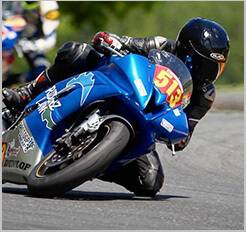 Motorcycling expense is a perpetual expense not just on the bike itself, but also on the rider. Even if you never have to crash-test your set of gear, seams will tear, holes will pop up, and you go long enough without washing certain articles and you deal with the funk. 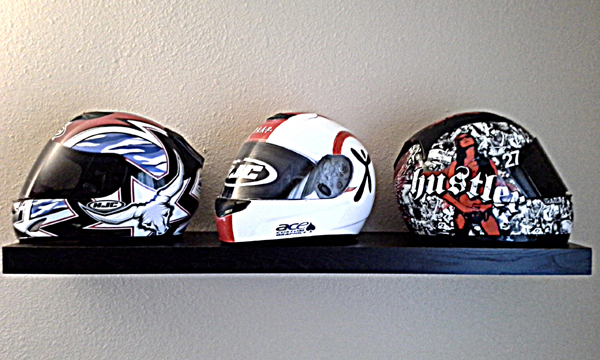 Even helmets have a recommended shelf life (5 years). 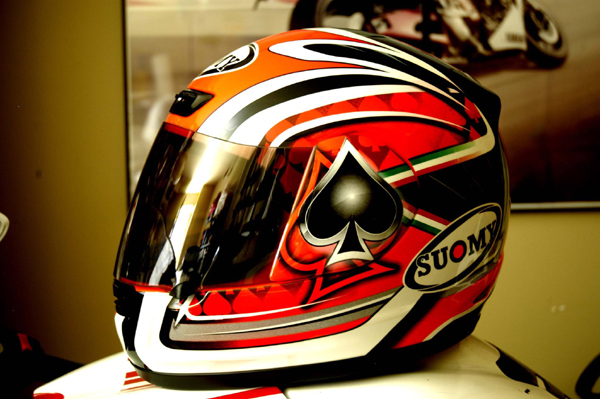 Suomy Apex Fabrizio Replica – without a doubt THE lightest helmet I've worn! Motorcycle helmets are a funny thing. Just like motorcycles themselves, they're a dichotomy in how delicately they must be handled in otherwise non-delicate use. Motorcycle helmets only need one hit – one very good hit – for them to do their job and simultaneously be rendered incapable of doing their job effectively any longer. That good hit can be from a brutal high-side crash, or simply dropping it from a table-top. If the latter, best to have the manufacturer test the helmet for effectiveness, but pretty much there's a good chance that the helmet's integrity, and thus its effectiveness has been compromised, just like that. 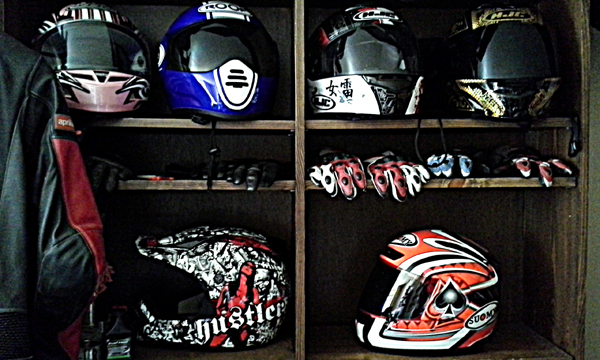 I have a lot of helmets. A LOT. More helmets than I or my entire household have heads to use them. I love helmets though. More than your bike, you can pick and choose the style and colors that best reflect your personality. And a helmet designed aesthetically-well just appeals to my creative side; if sushi is art you can eat, helmets can be works of art on your head. The Retired Gallery – each one having taken the hit for my head. They all deserve to be honored! I'm a budget rider though, and that carries over to when buying helmets. You can more often than not find me in the Budget Camp where, while I realize that the $500+ helmets will no doubt protect your head, helmets for much less can do the job just as well and the same. I've personally proven this numerous times, un/fortunately. I've had on-track and off-track crashes ranging from severe to mild in nature, all with my head touching if not slamming against the ground. Each time I was able to walk away and, even if with a severe headache for a few minutes, I've never found myself unconscious or having to take a ride in an ambulance. 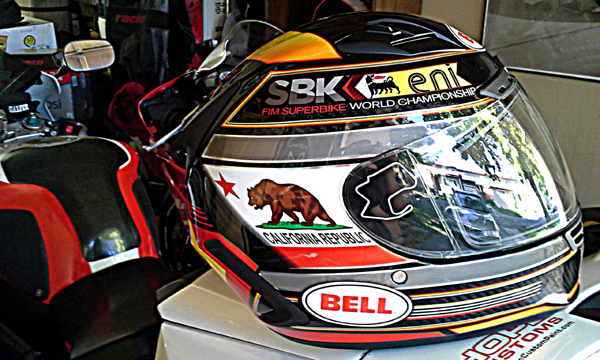 Bell Star Carbon FIM World Superbike Laguna Seca helmet. I know. Hardly screams "budget" helmet. I did say I'm more often than not a budget rider, not exclusively! So what's YOUR head worth? I say don't bother with prices. If a particular helmet beckons, just go for it. What's more important is that you protect your head. Because when it comes to head protection, spending any amount of money is better than not spending any at all. wow! you have shared really great tips for our safety. The tips are fully worth for our health. Thanks for sharing it.